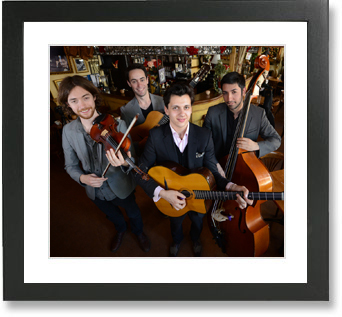 Nouveau Boheme comprises some of the country’s finest Gypsy Jazz musicians. Between them they have performed at Wembley Stadium, The Royal Albert Hall, Buckingham Palace, Festival Django Reinhardt Samois sur Seine and at the BRITs after party. They play a mixture of Gypsy Jazz, Parisian Musettes, and Jazz Standards, all performed in the inimitable style of Django Reinhardt and the Hot Club of France.